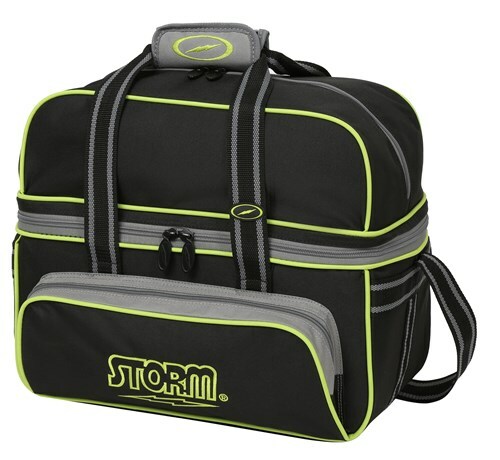 The Storm 2 Ball Deluxe Tote Black/Grey/Lime holds 2 bowling balls, shoes, and accessories. This bag is a good match for anyone that only has two balls or someone who just wants a smaller bag to make quick practice trips to the lanes. How much of the back is transparent? is it just plastic? Hello! The back normally will have a smaller sized plastic piece that is big enough for you to see what balls are in the bag. Does this have a ball divider? Yes, this double tote will have bowling ball dividers. Does the bag can hold two 14 pounds balls? Due to the time it takes to produce the Storm 2 Ball Deluxe Tote Black/Grey/Lime ball it will ship in immediately. We cannot ship this ball outside the United States.